In its latest annual report, the Kroger Company notes that it's "one of the largest retailers in the world based on annual sales." In FY 2016, the supermarket chain saw sales reach $115.3 billion, up 5% from the year prior. Recent numbers state that Kroger employs around 443,000 full- and part-time employees, and operates 2,796 supermarkets, either directly or through subsidiaries. But, as recent movements in the grocery sector imply, continued growth in this industry is no guarantee. 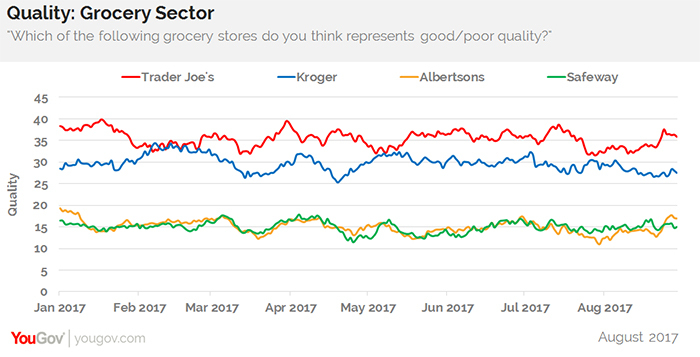 Looking at how US consumers feel about Kroger, along with rivals Trader Joe's, Albertsons, and Safeway, reveals that Trader Joe's tops the list in quality. Kroger tied things up in February and May, but the two chains have since separated. 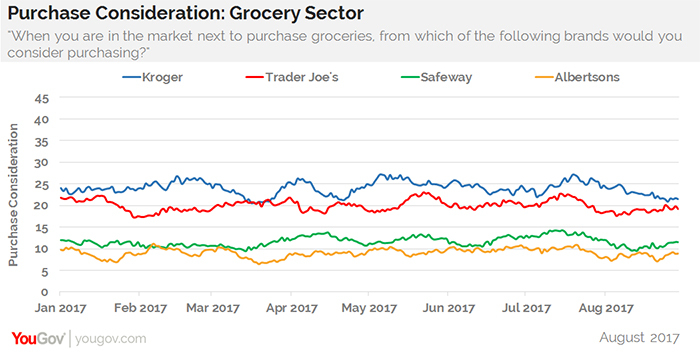 At present, Kroger has a score of 27.5, while Trader Joe's sits at 35.9. Albertsons and Safeway, meanwhile, currently come in at 16.9 and 15.0, respectively. Value, however, tells a different story. 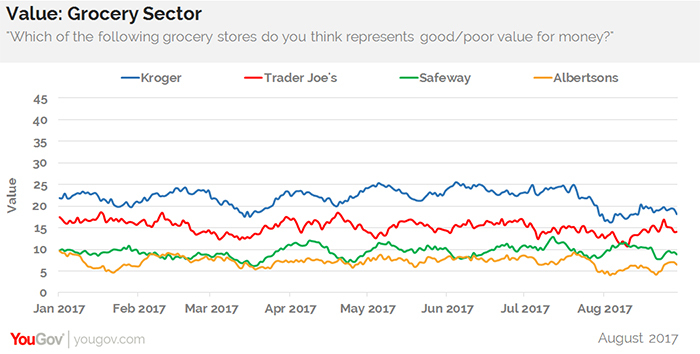 When asked to rate each brand according to whether it represents good or poor value for their money, more US consumers lean toward Kroger than Trader Joe's. On this brand health metric, Safeway and Albertsons appear much closer to the two leaders. When it comes to purchase consideration, which asks US adults how likely they'd be to shop at a particular store when next in the market for groceries, Kroger has maintained the lead for the majority of 2017. The most recent numbers imply that 21.5% of consumers are open to shopping at Kroger the next time their fridge needs filling. The Kroger Company plans to release its Q2 2017 earnings on Friday, September 8, 2017.